Dave Brown wrote: I lost the top 2 feet off my 8ft tall, 10ft wide Fatsia, at -10C in Dec 2010, and growth was very weak last year. I'm fascinated that you lost so much from the top growth Dave. I planted 2 Fatsia japonica and 2 Fatsia japonica 'Variegata' in the ground in Sep 2010, up here in merry old Yorkshire. These were only from 3L pots and other than the expected droop with the frost, they cruised through that shocking spell that hit us all. The Variegata's were quite slow producing new growth last summer, but the plain green ones have shot up. I'm really regretting not having any temperature equipment outside, but I did take some snaps over a period of a few days. It was quite disturbing how much the ground moved over a few days. If you're curious, a 10L Phormium tenax was planted right besides them and was almost completely trashed. There's barely been any new growth since, but it's still clinging on. "DEATH is nature's way of telling you you should have slowed down"
Could maybe have something to do with the wind? The one here at the botanical garden has a sheltered spot surrounded by buildings, high trees and dense bushes. What you also need to take into account is the duration of cold. December 2010 was bad in particular, for the duration of the cold period, so Dave's -10 temperature, among a couple of weeks of sub-zero temps at night, and many day's too, would do an exposed Fatsia more harm than just a few hours [or less even] at -15, which is often the case when minimum temperatures are reached. You could carry a Coconut palm down the end of the garden and back for a couple of minutes at -15 and not see any adverse effect, yet it's still seen -15. I have a Fatsia in my very cold Lancashire garden that has been there about 10 years and is at least 10ft. It started life as a tiny little plant from Asda. Year after year it has given me the greatest pleasure and helped me to continue my quest to create a tropical garden ( everything else I planted over the years has gone -apart from the bamboo). However the last couple of years it has become very tired looking with wilt and branch problems. I have cut these back and a new shrub in now coming along nicely. Dont know what caused this perhaps its just what Fatsia do.... any explainations anyone? Only the variegated and Spiders Web suffered, the bog standard one (which was further from house, so a bit more exposed) was fine. My Fatsia survived -18c in an exposed partly shaded spot ,damaged but doing really well again now! Im not sure what kind of japonica this is since it was given to me but its not fatsia..Either way these withstand -20C with no problems. since I can't say I've ever seen a fatsia in person are they just a larger form of this plant? 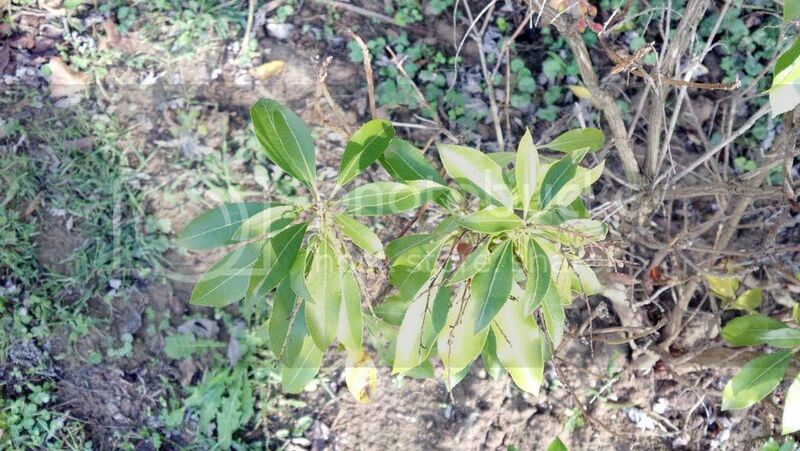 It's not a Fatsia Mike , it looks more like Pieris to me, which likes acidic soil. 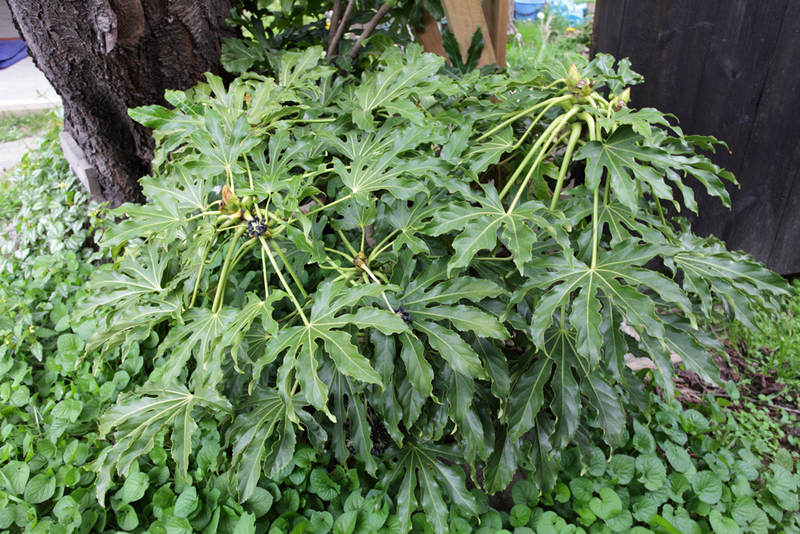 Fatsia leaves are totally different they are a lot larger and look more like Tetrapanax in shape but not size. I asked a few people and apparently you can keep fatsia here with mulch and a little effort so I will be trying it in the spring. I would say -10°c would be closer to its limit. A friend of mine plants survived -19 degrees. This year I bought two pc. I'll try, because I like it. The coldest here has been -11.2c so I can't comment on any lower temps. Sure, they get a little scorched by frost but quickly recover after being 'frost pruned'. Good thing is that they are plentiful and cheap to replace if lost. I'm going to plant a Fatsia Polycarpa next year to see how it fares. I'm at an age where my back goes out more than I do. Nigel Fear wrote: What you also need to take into account is the duration of cold.